It's my pleasure to introduce to you, SARA! So, I will be the first to admit that I totally put off buying a wedding dress. My procrastination was due to several reasons: 1) I didn't get the feeling that the dress I had picked out was "The O,e", 2) I didn't want to have to order a size 20 wedding dress, 3) I had an unrealistic idea that it would only take a couple of months to get the dress in, and I could always rush order if I needed to. 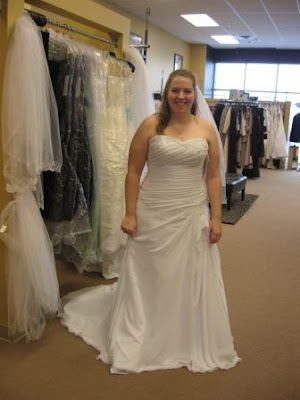 Last week, while stopping by a local shop to try on a couple of dresses, I found out that it might be impossible to get the dress I was planning buying in time for the wedding. Why did I only leave myself 4 1/2 months? Well, on Friday my Mom and BM Mandy headed out to purchase my dress. Friday was the day, wether I liked it or not. I had picked out a dress that I really liked and was ready to order, but after finding out that I might not be able to get it, decided to try on a few gowns. The first stop on our trip was Bridal Lane in Dorr. The store front seemed kind of small, but they had an awesome collection and the sales women were very helpful. We browsed the racks and picked out about 10 dresses to try on. Three dresses into I slipped into Sara: chiffon, beading, rouching, what more could a girl ask for? It was perfect, but could I get it in time? I walked around in the dress for a few minutes while the sales clerk called the company to see what they had in stock. "Good news," she said. They had the dress in stock, but in a size 16. Well, that wasn't going to work, I have been trying on size 20 dresses. But, they could rush it to me by May 1st, allowing plenty of time for alterations. I was sold. I started to order the dress and took my measuresments. 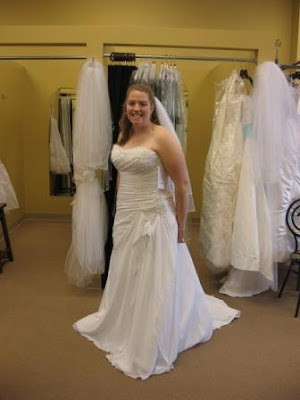 I was in awe, my waist measured into an 18, but my bust and hips measures at at a 14 & 16. What should I do? A 16 was in stock, but should I risk getting a dress too small? I asked the clerk if I could try on a size 18 by the designer. They didn't have one, but they did have a size 16, in a mermaid cut of all things. If that fit, I knew mine would. And it did! So, in the end, the procrastination paid off. I found a dress that I absolutely love and is everything I wanted. And I will have it next week. It was just meant to be.